Increase your site's rank in search engines and Shopping sites. TrafficBotPro can search your keywords on search engines (Google, Yahoo and Bing) and shopping sites(Amazon and Ebay), then found your site or product and click into your site or product page to view. 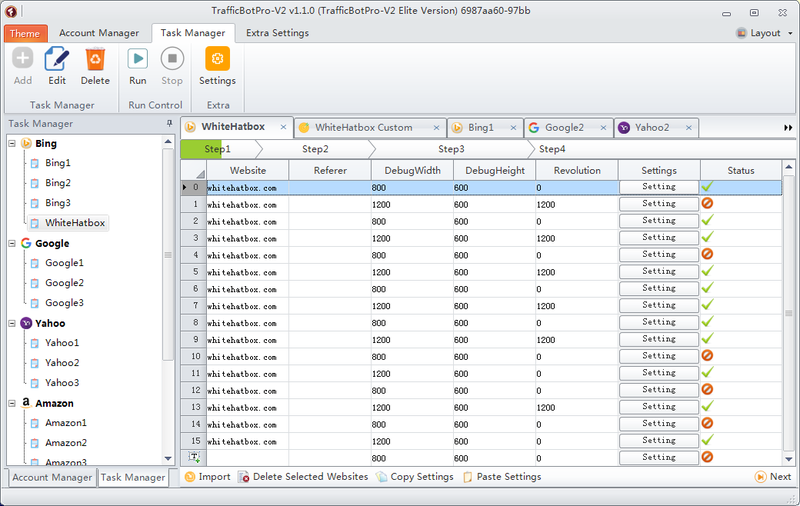 TrafficBotPro can simulate many different people to do this base on your settings. You can set to get how many search/click/view in certain time, and you can also set the ratio of search, click and view, all will be done like real human and your site/product rank will get increased fast. Click yourself AD to make fast money or beat your competitors by clicking their AD automatically. TrafficBotPro can visit any page directly or from a search, then click any AD you set on the page automatically. It can simulate real human operation by setting random page stay time, mouse move, scroll, inner link click, proxy, useragent and visit interval etc... You will make fast money by this AD click bot and your competitors will be crazy because of this. A low ranking of the website, sponsors unsatisfied? Spending a hard time to gain venture capital, but due to a slow increase of business, you can not reach the requirement of investors, which affects your business seriously? Try TrafficBotPro immediately to meet investors first and then carry out business attentively. Few hits and fail to find sponsors? The website are less popular, and you think it difficult to find sponsors or advertisements sells badly? Try TrafficBotPro to increase hits and welcome the arrival of advertisers, in addition to selling well. A new website of a company, to simulate stress testing? 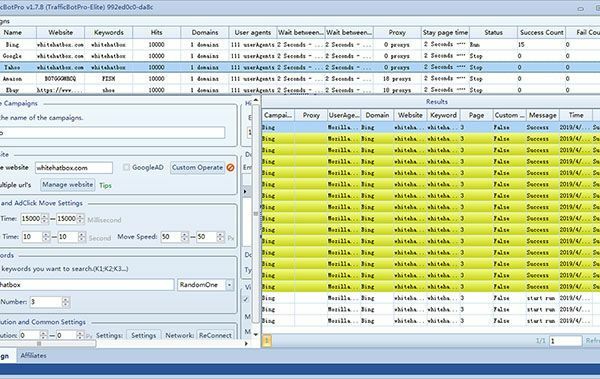 TrafficBotPro is a multi-functional and professional traffic tool, which has advanced functions of self-defining querying interval, pages turning interval, staying time, visit and click ratio, proxy, useragent, screen resolution etc. 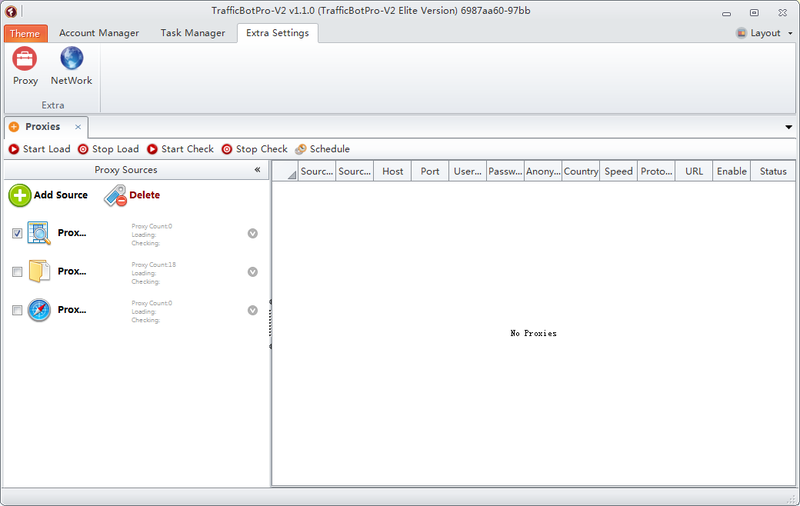 TrafficBotPro is very powerful and smart, you can run multi-tasks at the same time, and you can also run schedule tasks. TrafficBotPro is easy to operate. The interface is concise and pleasant, emphasizing more on experience. You will find it simple to run it owing to the detailed information of functions. It is user-friendly and needs no installation. You can run it after downloading and extracting. Plus, we provide 7*24*365 great support for you. Besides, it is real and effective, and based on the principle of web visits. You will definitely get much real traffic to promote the ranking and popularity in a short time. You can use TrafficBotPro with full confidence because it features the latest Anti-fingerprint technology that is able to bypass detection. And yet, the ability to completely replicate human behavior would make even a smart AI like Jarvis, failed to notice it's a robot that is visiting the page. 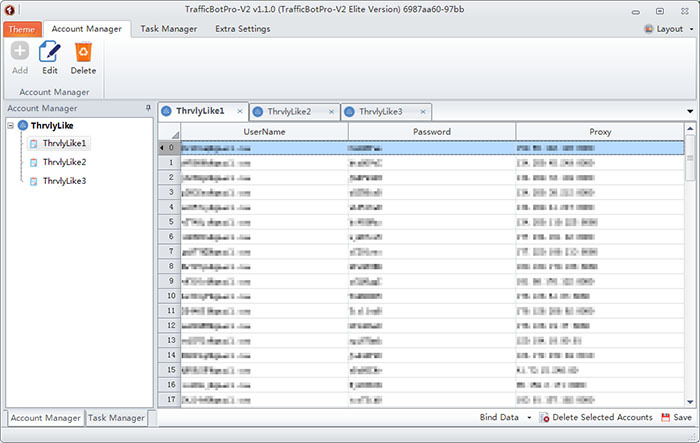 Add different accounts of different websites and centrally manage these accounts (batch import accounts and bind proxy). Allow to set tasks step-by-step and support for batch importing tasks, in addition, custom batch-tasks management (like click AD), which leads to a more convenient task-setting. Associate multiple tasks and click any task, all associated tasks will run at the same time, so as to some website can gain more traffic. 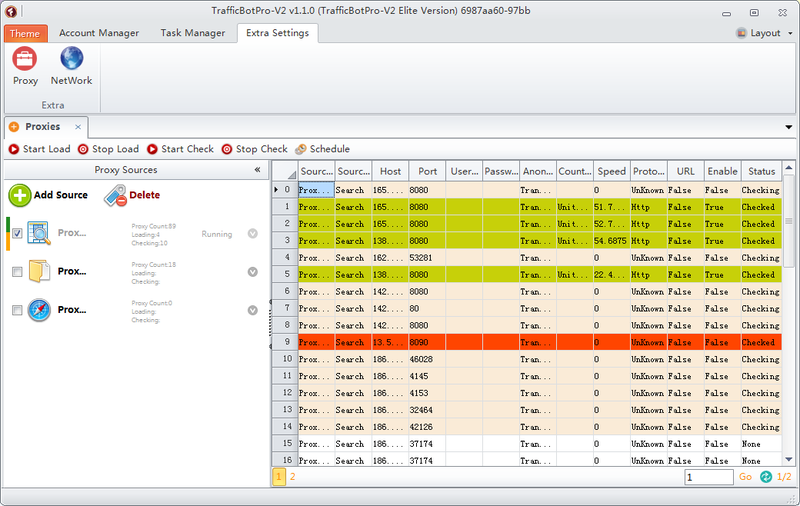 Allow to set up an independent running plan for each task. This is another amazing feature of TrafficBotPro. Thanks to this feature, you don't need to buy proxy or spending hours to find proxy anymore. Every time you run your tasks, this software will automatically find proxies that work. Automatically Check the Proxy's Country, Security, Status and Speed etc. Firstly users can enter the proxies setting to search for the free proxies, or customize the proxies or import the local proxies, then the program will check the proxies ‘ security, the running status and speed etc. 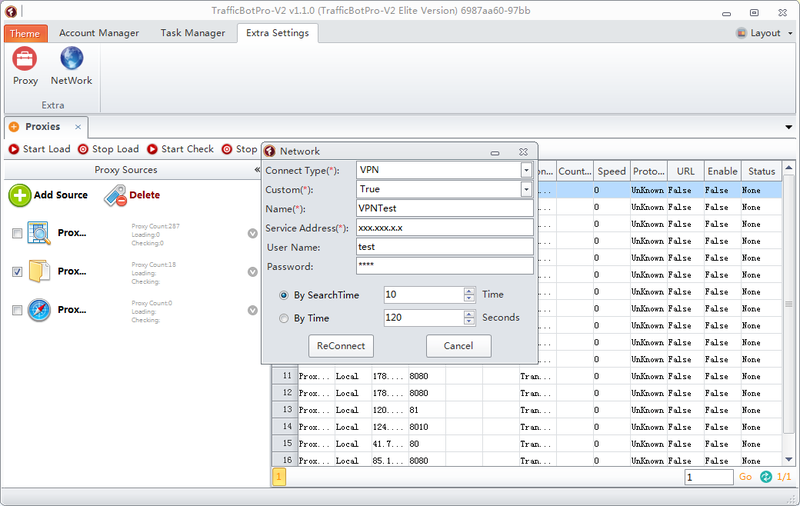 Allow to set VPN or ASDL reconnection in the Network setting to gain new IP addresses( if VPN service provider or network service provider supports for reconnecting and allotting new IP addresses), then reconnect VPN or ASDL based on its number of runs or running time. Visit your sites directly with different settings and proxy to increase the site's traffic. Search your keywords on google/yahoo/bing and click to visit your site in the search results. Search your keywords on amazon/ebay and click to visit your product page in the search results. Browse the page directly or from Search Engine, then click the ad you set. This is another amazing feature of TrafficBotPro. Thanks to this feature, you don't need to buy proxy or spending hours to find proxy anymore. Every time you run your tasks, this software will automatically find public proxies that work. Customize useragent to simulate different computer. Customize browser size and screen resolution. Support proxy to simulate different location. TrafficBotPro has been tested on Windows XP, Vista, Windows 7, Windows 8, Windows 10 and MacBook with Windows VM; it's advisable to have a screen resolution larger than 1024x768px for optimal interface display due to the large amount of functionality.